Vijaya Bank reported nearly three-fold jump in net profit for the fourth quarter ended March 31, 2017. The company added Rs 385.35 crore to Rs 9,214.35 crore in market valuation. 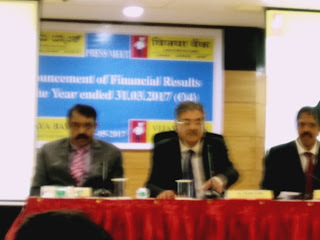 Vijaya Bank has reported a nearly three-fold jump in net profit to Rs 204 crore for the fourth quarter ended March 31, 2017. The bank had posted a net profit of Rs 71.31 crore in the January-March quarter of 2015-16 fiscal, Vijaya Bank said in a regulatory filing. Total income of the bank rose to Rs 3,504.73 crore in the January-March quarter as against Rs 3,228.48 crore in the year-ago period. The board of the directors of the company have recommended a dividend of Rs 1.50 per share or 15 per cent for 2016-17. As far as asset quality of the bank is concerned, the gross NPAs as a percentage of total advances declined marginally to 6.59 per cent from 6.64 per cent in the same quarter a year ago. Its net NPAs also eased to 4.35 per cent as against 4.81 per cent at the end of March 2016.